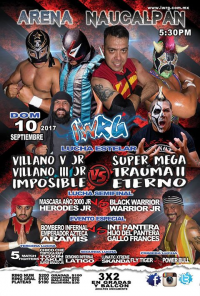 Demonio was DQed in what was advertised as a super libre match. They set up another one. Dragon Fly replaced Hijo del Alebrije. Villano III asked for a title shot despite losing. Terry & Diablo fall on their 3rd defense. Warriors are new champs. Leo replaced Rafy and won. 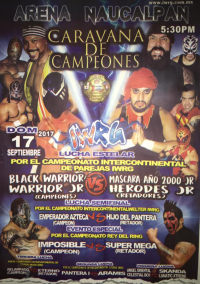 Hijo del Pantera will finally face Emperador Azteca for his title next week. Super Mega wants a title shot at Imposible. 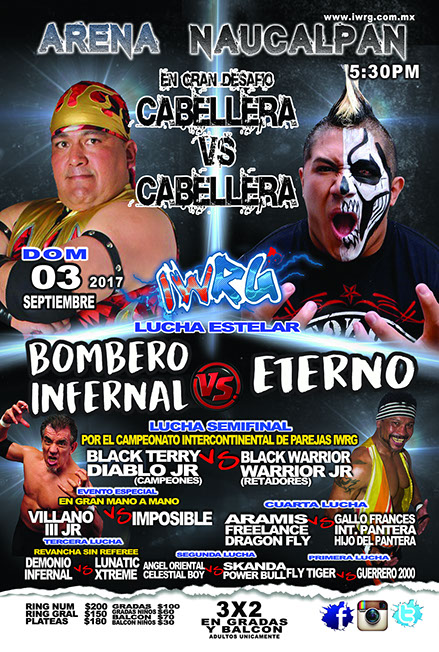 Hijo del Bombero replaced Celestial Boy (injury). Straight falls. second defense. Panthera took falls 1/3 to retain. second defense. The power went out during the third fall of this match. Eterno took falls 2/3 to win the title. third defense (all vs Mega, last went to a draw). Imposible took 1/3 to retain. first defense. Warriors took falls 1/3 to retain. 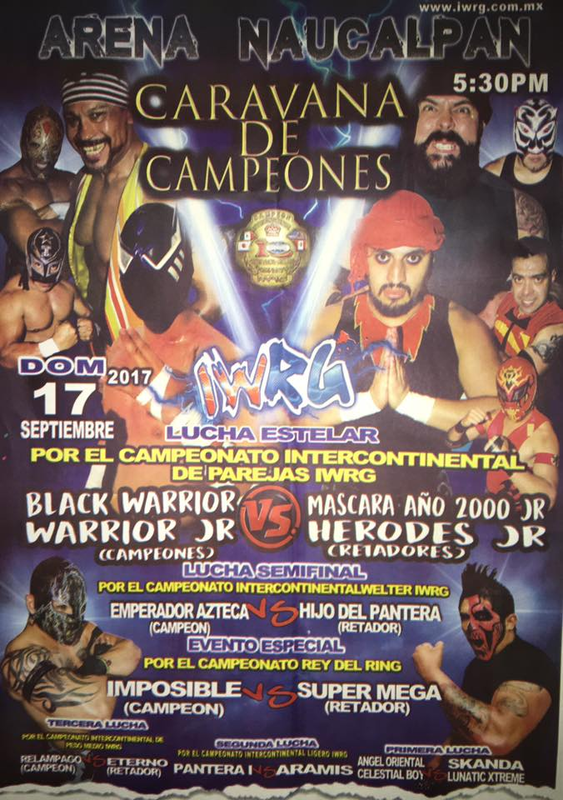 Herodes & Mascara fought each other after the match. Two mystery men showed up to help Mascara Jr. against Herodes. The power went out a second time early on. 4) Black Dragón, Dinamic Black, Dragón Fly b Gallo Frances, Taylor Wolf, Violencia Jr.
5) Bombero Infernal, Imposible, Villano V Jr. b Black Warrior, Eterno, Warrior Jr.
Bombero and Eterno continue to feud after the hair match. Mascara took falls 2/3 to win the title. Herodes falls on his 3rd defense. 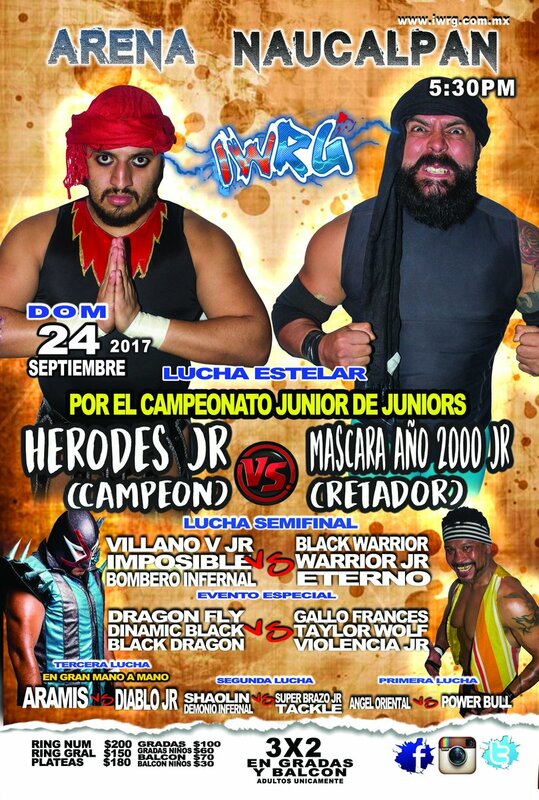 5) Chico Che, Leo, Teelo b Hijo del Alebrije, Ovett, Súper Brazo Jr.
Hijo del Alebrije replaced Picudo Jr. Ovett & Super Brazo had problems. 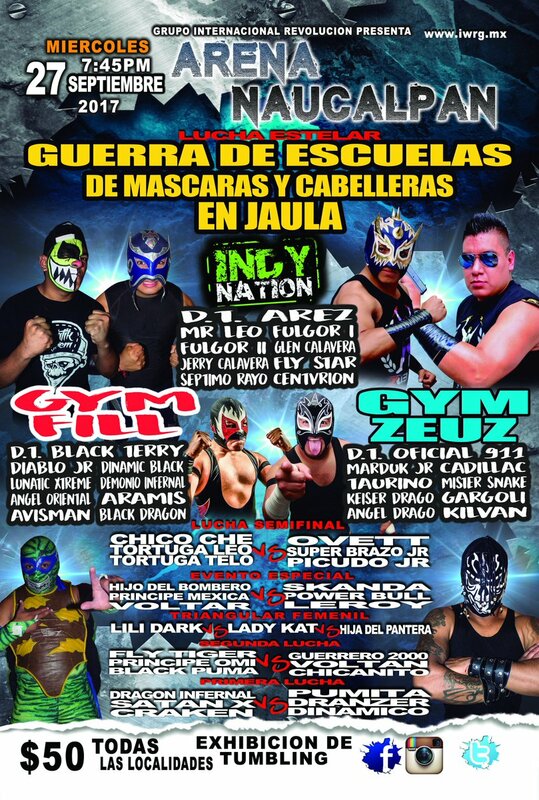 GYM FILL (Black Terry) vs Indy Nation (Arez) vs Gym Zeus (Oficial 911). Warrior Jr. & Power Bull replaced Diablo Jr. & Avisman. Latigo (back in Indy Nation?) replaced Jerry Calavera. Only Lunatik & Demonio were betting their hair. Centviron suffered a shoulder injury and was left along with Aramis and Lunatic, who attacked the joint. Aramis and Lunatic turned to leave, but Arez cut off Lunatik and helped Centviron to win.